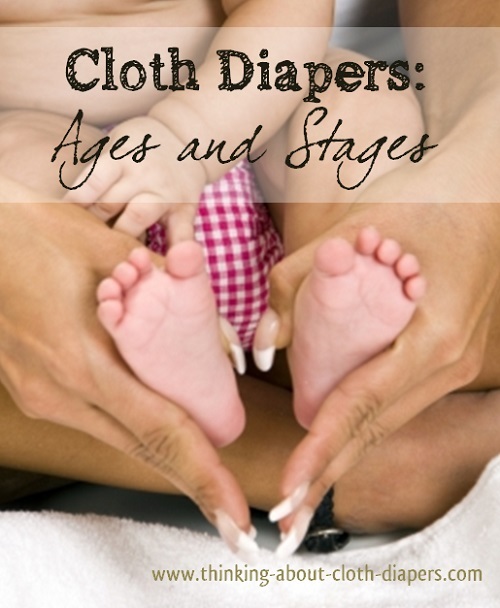 Are you planning to start cloth diapering right from day 1? We've got information on using newborn cloth diapers, including some of our favorite brands for brand new babies. 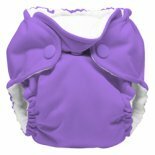 If you plan to start cloth diapering on day 1, you may want to consider buying newborn cloth diapers. Most parents find that fitted size small diapers and one-size diapers don't fit a brand-new newborn that well. You might be thinking, "I thought they were called one-size - as in, these diapers are supposed to fit from birth until potty-training..."
Please note: We've split our Newborn Cloth Diapers section into two articles. 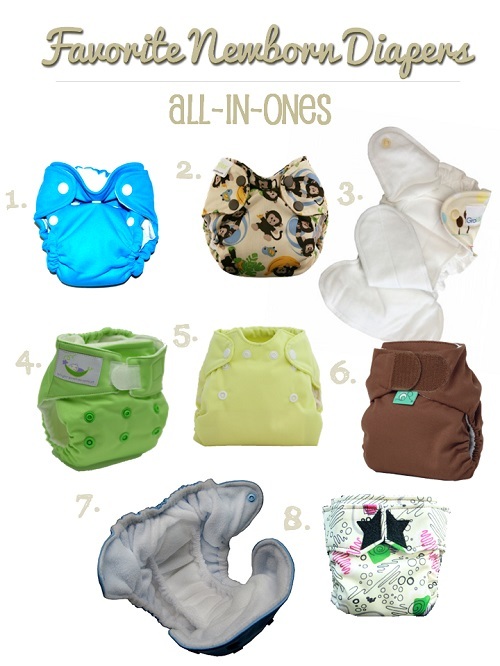 This article discusses all-in-ones, while a second article discusses newborn diaper covers, prefolds, and fitteds. Do I Really Need Special Diapers for a Newborn? If you ask any experienced parent (ask one that recently had a newborn because they'll remember better! ), they'll tell you that it's important that your diaper offers a snug fit for newborns! You want to have a diaper that is snug around the back and across the back to contain runny newborn poop. It's not that you can't use one-size or small sized diapers with newborns, but they may not be as reliable because they may not contain every mess! If you can't get a snug fit, you will have to be prepared for a few leaks. The occasional mess doesn't bother some parents. Don't totally rule out one-size diapers though. If you don't want to buy special newborn diapers, there are some one-size options that seem to size down to work better for newborns than others. If you don't plan to use newborn cloth diapers initially, click on this link to skip down to our recommendations of one-size cloth diapers for newborns. Newborns need to be changed at least every 2 hours, so you will need more cloth diapers at this stage in your baby's life than any other stage! By one month of age, many parents can get away with a stash of approximately 20 cloth diapers if you plan to do laundry every day. 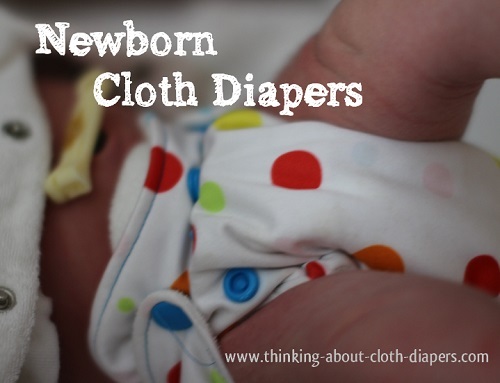 With newborns, you will need 24 (or even more) diapers - unless you want to do laundry every day! Of course, the answer to this question depends a lot on how often you plan to wash your cloth diapers! That said, if you plan to cloth diaper a newborn, you'll probably use more cloth diapers than you expect. I washed every 2 days, and I found I needed close to 3 dozen diapers. We used 12+ each day, and it took a long time for some of the all-in-ones (especially our Lil Joeys) to dry. I usually ran everything through the dryer once, and then hung anything that was still damp out to dry. You can get away with less diapers, but you may need to wash more frequently, or put the occasional disposable on if you fall behind in cloth diaper laundry. 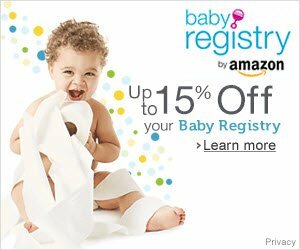 The cost of two full sets of diapers can be daunting for parents who consider buying a set of newborn cloth diapers and then a second set of sized or one-size diapers later on. Since newborn diapers typically last from 6 to 12 pounds, they aren't usually used for more than a couple of months, and some babies may outgrow them even sooner. A set of 24 fitted, pocket, or all-in-one cloth diapers in a newborn size can add up fast! For many parents, a set of infant size prefolds and 6 to 8 wraps (I prefer newborn Bummis Super Brites) or wool covers can be a cost-effective option. If you decide to upgrade to pocket diapers when your baby outgrows the infant size, the prefolds can be used as inserts, or even burp cloths. Lots of new parents don't switch to cloth diapers immediately. I know, because I was one of them. The first few weeks as a new parent can seem overwhelming at times. With my first son, I found it much easier to transition to cloth diapers when my little man was about a month old. 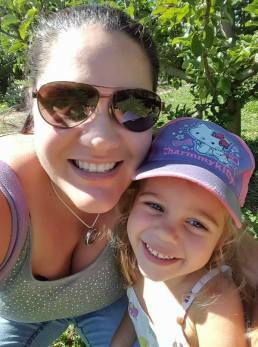 By then, I wasn't breastfeeding every hour, and I felt I had a bit of time to get familiar with washing and folding diapers. By then, he had also gained a few pounds, and filled out his cloth diapers much better! That said, there are some great reasons to consider cloth diapers right from the beginning. With my second, I started with cloth the day we left the hospital. Can I Use Cloth Diapers in the Hospital? Many parents want their baby's first diaper to be a cloth diaper. Whether that's possible or not depends on your hospital. There are lots of hospitals that encourage cloth diapers, and some even provide cloth for use while at the hospital. It's best to check with your hospital to find out whether using cloth will be allowed, and whether you should bring your own or if they will provide them. Which Cloth Diapers are Best for Preemies? They look so big... how can they be comfortable? Even bitty little newborn diapers can look huge on a tiny newborn! 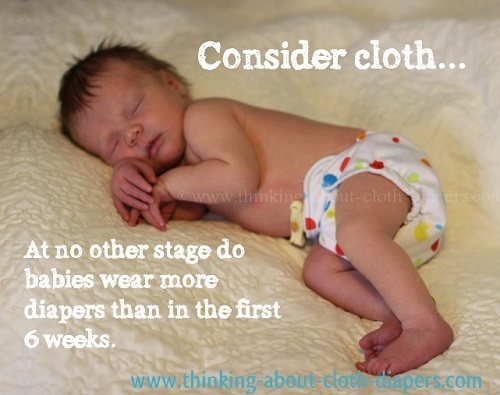 And if you choose to go straight to one-size diapers, your little one will look lost in them! Can I Use Cloth Diapers if I Choose Circumcision? This topic is a sensitive one, which can make iit hard for parents to find the information they need. Padded Tush Stats has a good article on this, and I urge you to read it. Is it Safe for the Cord Stump to Be Covered? Do I Need to Wait Until After the Meconium Passes? How Many Cloth Wipes Do I Need? I have heard that newborn poop stains. Will it ruin my cloth diapers? Read our article on Where to Buy Cloth Diapers here. If you're not sure which newborn brand to buy, try out a few. Kissed by the Moon, a California-based retailer that offers newborn cloth diaper rental programs, sells a mixed pack of the gently used rental newborn diapers for much less than the original prices. Since newborn diapers aren't used for long, these diapers are in great shape, and it's a great way to experiment! Specially designed with inner gussets - these are great at containing runny poop and stopping up-the-back blow-outs! Slide2Size system - Small adjustable toggles hidden inside the diaper shell are used to adjusts leg openings from 2 to 14", so you can get that perfect fit, no matter how big or small your baby is! This is a 2-part series on newborn cloth diapering. 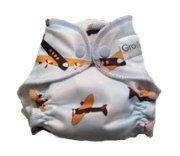 Continue reading about Newborn diaper covers, prefolds, and fitteds.